Pour 1/2 cup lemon juice into a small saucepan. Sprinkle 1 envelope (or 2.5 teaspoons) of unflavored gelatin on top and let sit for 1 minute to activate. Place over medium to high heat and bring to a simmer. Remove from heat and add another 1/2 cup lemon juice. Set aside. Mix 1 box cherry gelatin with 1 cup water in another small saucepan. Sprinkle 1 envelope (or 2.5 teaspoons) of unflavored gelatin on top and let sit for 1 minute to activate. Place over medium to high heat and bring to a simmer. Remove from heat and add 1 cup vodka. Add one tablespoon of cherry gelatin mixture to lemon juice gelatin mixture to change color to pink. Grease mini muffin tins and wipe with a paper towel, then fill halfway with lemon juice gelatin. Place in refrigerator for 30 minutes or until slightly firm but still sticky. 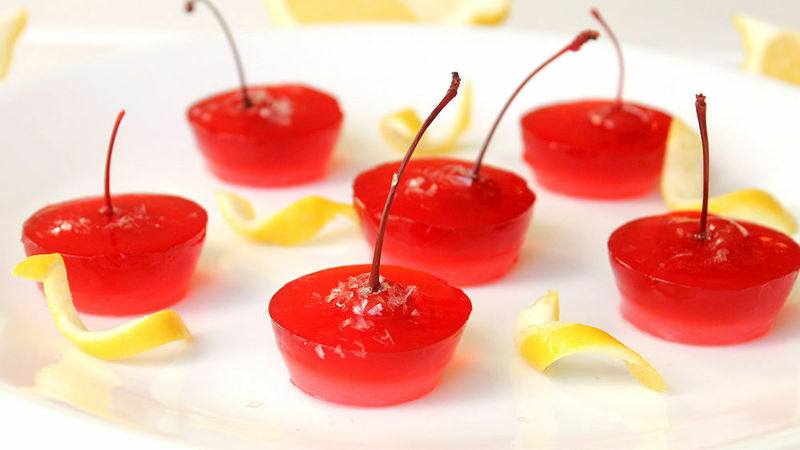 Slice the bottoms off 24 maraschino cherries so they can stand upright in tins. When lemon juice gelatin (or pink layer) is sticky and slightly firm, pour cherry gelatin mixture on top (for red layer). Place in refrigerator and then place cherries upright with the sliced side down. Refrigerate for 2 hours or until completely firm. Run hot water along the bottom of the tins carefully to remove each shot. They should slide out easily. If any water hits the shots, dab them with a paper towel gently and immediately. Place back in the refrigerator until serving. Top with edible glitter before serving. If there is leftover gelatin you can make layers in a cake or brownie pan and cut out shapes after they set with cookie cutters. Be sure to slice your cherry bottoms horizontally. If you slice them at a diagonal they will sit with the stems not completely upright in the tins.